This year’s summer course was held in Lymington Leisure Centre. During the five days of training over 70 student’s attended from the Wado Academy, both here and in Europe: namely from: Finland, The Netherlands, Germany, Italy, France, Norway, Ireland and of course from England, Scotland and Wales. As can be seen from the photograph above the Chief Instructor of the Academy, M. Shiomitsu 9th Dan Hanshi Shihan visited the course on the Sunday and everyone was delighted to see Sensei walk with the aid of a stick. His progress is remarkable since the start of his illness and shows what a determined spirit he has to over come adversity. Kazutaka Otsuka Sensei was not at the course this year, due to the sad passing of the Second Grand Master of Wado Ryu, his father, in late June. Consequently, Kazutaka Sensei has had to return to Japan to deal with his father’s affairs and it has been confirmed that he will be proclaimed the Third Grand Master of Wado Ryu Karate-do on 29th August 2015 in a special ceremony in Japan. All members of the Academy wish him well and success in the new responsibilities he now has by becoming the worldwide head of Wado Ryu. We look forward to seeing him at future Wado Academy courses in his new role. Peter Edwards Sensei will be holding a course in November with the proceeds going to Shiomitsu Sensei. It will be held at Seaham Leisure Centre, Co. Durham. Please contact Peter on 07850 355 844 if you require details on where to stay and so on. A group of Norwegians are coming so you can be assured of a good social event. 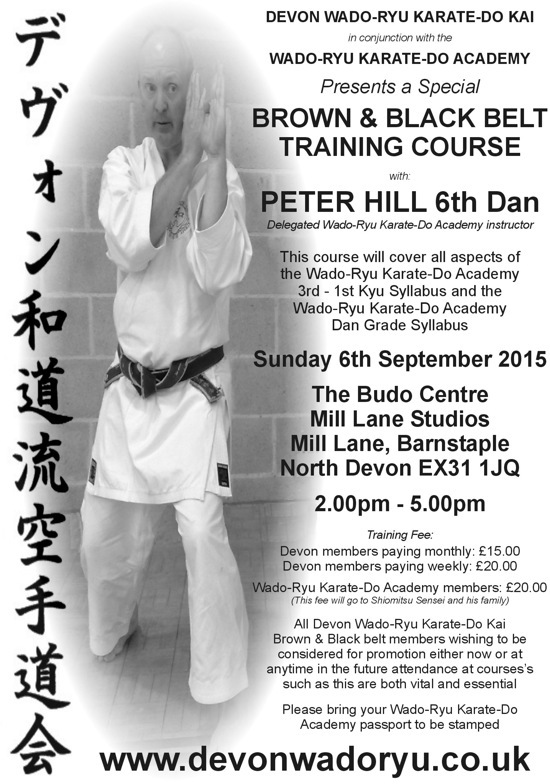 Course at Devon Wado Ryu – 6 Sept 2015. Peter Hill sensei also says if visitors want to make a full weekend of training, he also holds three regular classes at the group’s Bideford dojo the day before on Saturday from 1.30pm to 3.30pm. Please contact Peter if you require information on accommodation. I got confirmation from Maya on these dates.